Flowers are always in fashion! Especially this chic mix of pinks, greens and yellows, arranged in a style evoking the English hand-tied bouquet. It''s a stylish surprise for any lucky lady. 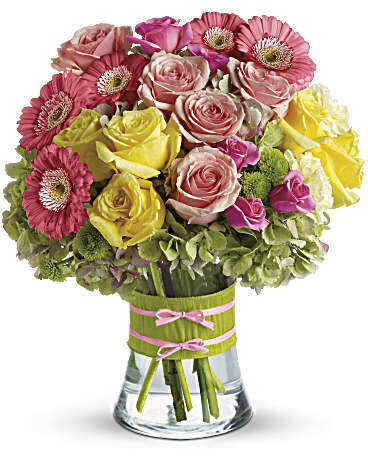 Mini pink gerberas, lush green hydrangea, yellow and pink roses, yellow carnations and green button mums are arranged in a clear concave vase that''s trimmed with a chartreuse taffeta ribbon and pink raffia.